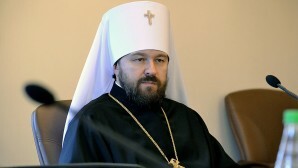 In his interview given to Italian II Sole – 24 Ore by Metropolitan Hilarion of Volokolamsk, head of the Moscow Patriarchate department for external church relations, in anticipation of the visit by the Holy See State Secretary Cardinal P. Parolin, he highlighted such topics as development of dialogue and cooperation between Russia and the Holy See, relations between the Russian Orthodox Church and the Roman Catholic Church and persecution of Christians in the Middle East. At the journalist’s request, His Eminence Hilarion also spoke about the significance of the bringing of the honourable relics of St. Nicholas the Wonderworker to Russia from Bari, which took place from May 21 to July 28, 2017. – The Holy See Secretary of State Cardinal Pietro Parolin in his interview to II Sole-24 Ore stated that differences are stressed every day between Russia and Western Europe and Russia and the USA. According to P. Parolin, in this context the task of the Holy See is to promote an improvement in mutual understanding between the countries and to build up a frank and respectful dialogue. What is your opinion? How do you evaluate the progress made on the two levels: dialogue between the Catholics and the Orthodox and, in the political sphere, dialogue between Russia and the Holy See? – One cannot but agree with the words of Cardinal Pietro Parolin concerning the need to build up a frank and respectful dialogue between both the Churches and the states. I am pleased to note that the last ten years have been marked with considerable progress in relations between both the Russian Orthodox Church and the Roman Catholic Church and Russia and the Holy See. Bilateral cooperation between our two Churches is developing in various areas. This cooperation has become possible through the growing awareness of the spiritual tradition of the first millennium of Christianity that unites us. The faithfulness of this common tradition is expressed in the positions the two Churches share on a number of the most burning problems of our time, involved first of all in the crisis of moral values and ousting of religion from the sphere of societal life in Western countries. In the recent years, growing ever more pressing is the problem of persecution and discrimination of Christians in a whole number of regions in the world because of extremists’ actions. This problem is deeply disturbing for both the Supreme Authority of the Russian Orthodox Church and the Holy See and compels us to unite our efforts in search of its solution. Among visible expressions of the level of confidence and mutual understanding reached by the Russian Orthodox Church and the Roman Catholic Church was the meeting of Patriarch Kirill and Pope Francis in Havana last year. Recently the relations between Russia and the Holy See have also developed fruitfully. Their positive dynamic was marked by the establishment of full-fledged diplomatic relations on the level of embassies in late 2009. Russia and the Holy See have similar stands on the problem of opposition to extremism in Syria. As you know, in September 2013 the Pope Francis sent a letter to Russian President Vladimir Putin with an appeal to help establish peace in Syria. In many ways thanks to the coordinated position of Russia and the Holy See, it became possible to avoid a military invasion in the Syrian territory, which would only aggravate the situation in the country. Concerning the situation in Ukraine, the Holy See has taken a well-considered stand, avoiding one-sided evaluations. The Vatican calls to dialogue and cessation of hostilities between the conflicting parties and insists on the observance of the Minsk Agreements. We are looking forwards to the visit of the Holy See Secretary of State Cardinal Pietro Parolin to Moscow since the meetings in preparation will help exchange points of view and work out together a common vision and versions of the solution of particular problems. – In the course of the historic meeting in Cuba, Patriarch of Moscow and All Russia Kirill and Pope Francis of Rome dealt with burning problems facing the world today. In your opinion, what steps have been made since the meeting towards rapprochement between the two Churches? What are the most important tasks still standing before us? – During the meeting in Havana last February, the Pope and the Patriarch dealt with the most burning problems both of the Orthodox-Catholic relations and the situation in the world today. 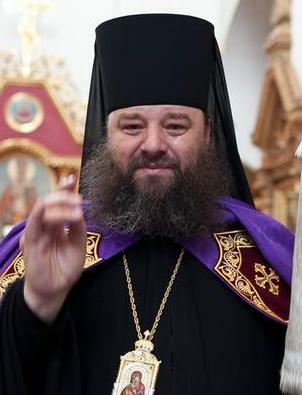 Stating in the Joint Declaration that ‘Human civilization has entered into a period of epochal change’, the Primates of the two Churches emphasize the need to unite the efforts of the Orthodox and the Catholics in the areas in which it is possible and necessary: ‘Our Christian conscience and our pastoral responsibility compel us not to remain passive in the face of challenges requiring a shared response’ (Par 7). It is my conviction that after the Havana meeting much has been done in this area. As is known, the principal incentive for the meetings itself was the tragic situation in which Christians in the Middle East and several other regions found themselves as a result of armed conflicts and extremists’ actions. Among concrete steps for developing Orthodox-Catholic interaction in this area was the visit of a group of representatives of the Russian Orthodox Church and the Roman Catholic Church to Lebanon and Syria in April 2016. The consultation held during the trip with local confessions should serve as a basis for developing further joint projects aimed to support our brothers and sisters in distress. Following the call voiced at the Havana meeting, in 2017 the Orthodox and the Catholics organized a number of joint events in defense of the Middle East Christians. Thus, in January 2017, the Fifth European Orthodox-Catholic Forum took place in Paris, devoted to the problem of terrorist threat directly involved in the situation in the Middle East and affecting everybody without exception today. Among important events was the World Summit in Defense of Persecuted Christians that took place in the US capital city of Washington, gathering together 600 representatives of various churches from 136 countries. The summit was organized thanks to the joint initiative of the Russian Orthodox Church and the Billy Graham Evangelical Association. Archbishop of Washington Cardinal Donald Wuerl and representatives of the Pontifical Council for Promoting Christian Unity took an active part in it. An important place in the Joint Declaration signed by the Patriarch and the Pope is occupied by an appeal to effective peacemaking and social solidarity in Ukraine. We are grateful to the Holy See for its support for the Ukrainian Orthodox Church expressed in condemnation of Bills No. 4128 and No. 4511, to be considered by the Supreme Rada. Their adoption would mean the creation of a legal basis for the capture of churches of the Ukrainian Orthodox Church and discrimination against it in the Ukrainian society. The consideration of these bills was suspended but there are no guarantees that it will not be renewed in the new political season. Finally, among positive results of the Havana meeting is the unprecedented event of the bringing of a part of the relics of St. Nicholas from Bari to Moscow and St. Petersburg in May-July 2017. For two months of the relics’ stay in these cities, they were venerated by about two million and a half believers from Russia, Ukraine, Belarus, Moldova and other countries. St. Nicholas is one of the most venerated saints in both East and West. The bringing of a part of these relics from Bari to Russia has become a visible testimony to the living spiritual tradition of the first millennium, which unites the Orthodox and the Catholics in spite of all the existing differences. We should develop cooperation in all the indicated areas for the sake of solution of the problems of concern for today’s world. – How does the forthcoming visit of Cardinal Pietro Parolin to Moscow fit in this context? What are your expectations? What can become the greatest result? – The Holy See Secretary of State Cardinal Pietro Parolin is invited to visit Moscow in the line of state relations between Russia and the Vatican, which have actively developed in recent years thanks to the fact that the Russian Federation and the Holy See have similar attitudes to a whole number of issues on the international agenda. As I have already pointed out, it concerns first of all the situation in the Middle East and Ukraine. According to the cardinal himself, it is the Middle East and Ukraine that will become the primary topics in his negotiations with the President and the Minister of Foreign Affairs of the Russian Federation. However, the visit of the Vatican Secretary of State to Moscow has certainly a great importance for the relations between the Moscow Patriarchate and the Roman Catholic Church. Along with negotiations with state leaders, the cardinal will meet with His Holiness Patriarch Kirill of Moscow and All Russia. Cardinal Parolin will also meet with me as chairman of the Moscow Patriarchate’s Department for External Church Relations as the structure responsible for the whole sphere of the Russian Church’s external work. During these meetings, we will discuss the whole range of bilateral relations between the Russian Orthodox and the Roman Catholic Churches, and I hope that we will outline new prospects for their development. – What, in your view, is the main problem in the relations between the Russian Orthodox and the Roman Catholic Churches? – The most painful problem in the relations between our two Churches is unia, which has done a serious damage to the Orthodox-Catholic relations in general for centuries now. In the Joint Declaration of Patriarch Kirill and Pope Francis, it is stressed that the past “method of ‘uniatism’, understood as the union of one community to the other, separating it from its Church, is not the way to re–establish unity” (Par. 25). Today the pernicious consequences of the unia hostile toward Orthodoxy can be seen in the provocative and even aggressive actions of the Ukrainian Greek Catholic Church, which have greatly intensified after the Kiev events of February 2014. 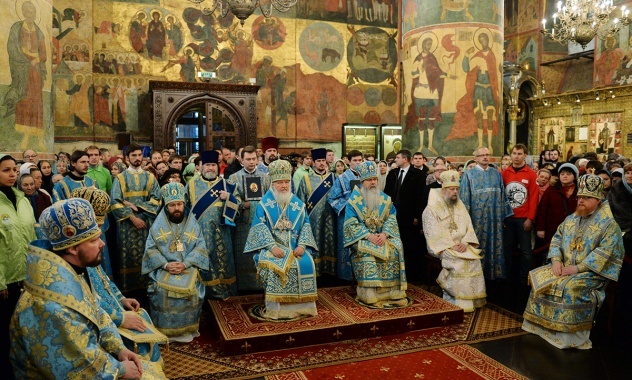 For the last several years, we have heard a great deal of politicized and aggressive statements of the Uniate leaders, insults against the Russian Orthodox Church and its Primate. There is an open proselytic expansion manifested in the establishment of new canonical structures of the Ukrainian Greek Catholic Church in Ukrainian southern and eastern lands, which have been Orthodox from time immemorial. There were direct calls to violence and Uniate attempts to seize Orthodox churches. Certainly, such attacks from the Ukrainian Greek Catholics cannot encourage a growth of mutual understanding and confidence between the Russian Orthodox and the Roman Catholic Churches. Nevertheless, we do not lose hope that in the future we will manage to find a solution to the acute problems existing today. 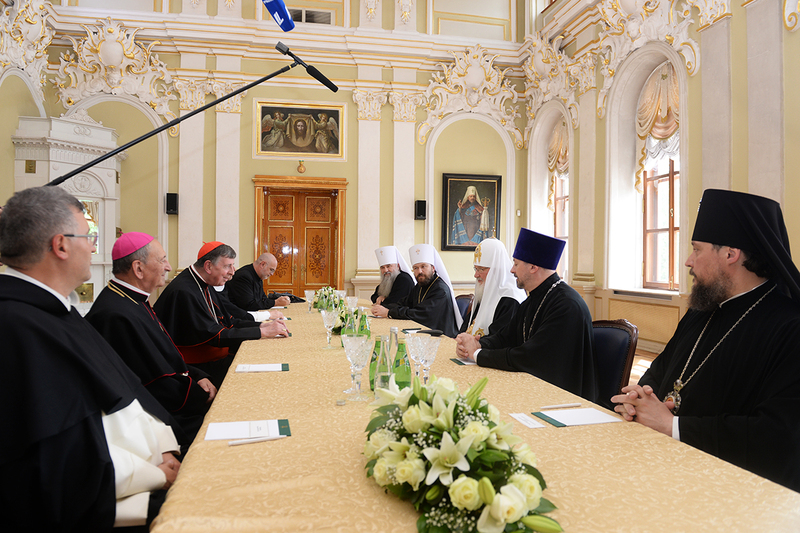 We are also grateful to Pope Francis for the understanding of the Moscow Patriarchate’s attitude and his readiness for constructive cooperation. – A tremendous number of pilgrims venerated the relics of Nicholas the Wonderworker during their stay in Russia. To venerate the relics of the saint, people had to stay patiently in long lines. Did you expect such a participation from the faithful? – For the Russian people, St. Nicholas has always been one of the most venerated saints. No other saint has as many churches dedicated to him in Rus’ as Nicholas the Wonderworker. This veneration is brought about first of all by the sincere faith of our people, who see from their own experience how quick is St. Nicholas to respond to their prayers and to come to rescue. It is not surprising therefore that such a great number of people came to Nicholas the Wonderworker in Moscow and St. Petersburg, ready to stand in line for many hours despite the weather. By their pilgrimage to the relics of the saint, people testified to their living faith, which could not be eliminated even for the seventy years of persecution against the Church. The true faith has been revealed by not only pilgrims but also volunteers who helped them. If in the beginning they were about two thousand, by the end of the relics’ stay in Russia we were helped by over 14 thousand volunteers. Most of them are young people – young men and women from secular schools and universities. The bringing of the relics of St. Nicholas from Bari to Russia has become an important step in the development of relations between the Russian Orthodox Church and the Roman Catholic Church. In this case, it was no longer a dialogue on the level of the hierarchy or theologians but the participation of millions of the faithful grateful for the opportunity to venerate the relics of their favourite saint. The veneration of common saints really unites Christians in East and West. – The war in Syria has become a focus of the Havana meeting of the Primates of the two Churches. How does the Russian Orthodox Church help the Syrian people together with representatives of non-Orthodox confessions? – The Russian Orthodox Church has always maintained friendly ties with peoples in the Middle East and taken their misfortunes as her own. From the very first days of the conflict in Syria, the Moscow Patriarchate has tirelessly raised its voice in defense of civilians and posed this topic at all the authoritative platforms, both Russian and international, including the UN, Council of Europe and OSCE. With the blessing of His Holiness Patriarch Kirill, donations were collected in all our churches and monasteries for purchasing humanitarian aid supplies. Then, with the help of competent state structures, they were delivered to the territories controlled by the legitimate Syrian authorities. Joint church-state delegations made repeated visits to Damascus with this aim. The topic of the disastrous situation of civilians in Syria, including the Christian population, remains one of the key ones in the Russian Orthodox Church’s interaction with non-Orthodox confessions, including the Holy See. Finally, in April 2007, under the aegis of the Presidential Council for Cooperation with Religious Organizations, an ad hoc Working Group was set up to include delegates of both Christian confessions and Muslim communities in Russia. As part of the work of this group, a consignment of foodstuffs and first aid medicines was collected and in the end of June was successfully delivered to Syria. All the participants in this project plan to continue its implementation in the nearest future.